Dr. Alidadi has extensive training and experience in cosmetic dentistry. Veneers are an affordable way to enhance your smile. A veneer is a very thin layer of porcelain that’s fixed over the front of your tooth to change its color, size or shape. Veneers can close a gap and hide stained, crooked or chipped teeth. Dr. Alidadi will sometimes use a veneer to repair a patient’s tooth as a more conservative approach than a full crown. Dr. Alidadi will work with you to create the smile you want. Dr. Feryal Alidadi has extensive training and experience in cosmetic dentistry including veneer placement. She has completed various continuing education workshops in cosmetic dentistry at Spear® Education and the Pankey Institute, two of the premier centers of dental education in the United States. Dr. Alidadi performs veneer procedures that preserve the most dental structure and teeth. Her procedures are done in a gentle, minimally invasive manner. Her goal is to create a healthy, natural-looking smile that enhances your appearance and lasts a long time. She’ll discuss your options and suggest the type of veneer that’ll work the best for you in your Free Cosmetic Consultation. While conventional veneers involve a much longer process, Lumineers placement is quick and easy. There are no shots and no drilling of sensitive tooth structure, unlike with traditional veneers. And Lumineers are proven to last for over two decades. 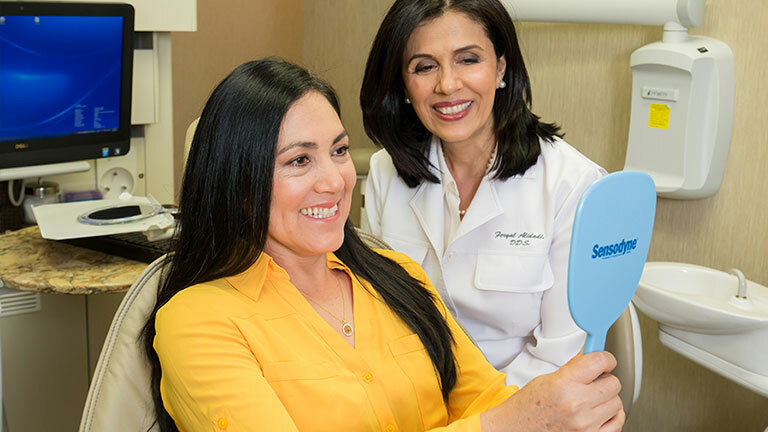 Transforming your smile with Lumineers takes just two easy visits to Dr. Alidadi’s office. On your first visit, Dr. Alidadi will take a precision mold. 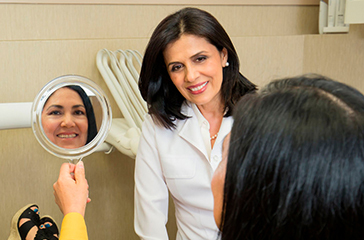 You and Dr. Alidadi will also select the right shade for your new, permanently white smile. On your second visit, Dr. Alidadi will check your custom-made Lumineers for shade and fit, and then attach them over your teeth. Dr. Alidadi typically recommends porcelain veneers due to their greater stain resistance and durability. However, if porcelain veneers are out of your price range, cosmetic bonding is an affordable alternative. Cosmetic bonding involves using a very thin coat of tooth-colored composite resin that’s bonded onto the front of your teeth to smooth out any imperfections. However, while not as expensive as a veneer, cosmetic bonding is neither as strong nor stain-resistant.